It was a dark, hot and humid night as we briskly walked to the dungeons. No just kidding. We sat in a hotel lobby waiting-- tick, tock, tick, tock. Then the booming voice of our tour guide, Jay, herded us to a corner. Dressed entirely in black including an ominous black cape and top hat, he introduced himself, interjected some jokes about ghosts and asked who believed in ghosts. A couple of brave souls raised their hands. Unfortunately I have to say, that was the highlight of the entire tour. It was all downhill from here. Then we set afoot to the first stop, and the first "ghost story" referred to the hotel and one particular occupant. Only the building and our imagination pictorialized Jay's storytelling. It was an entertaining story and he successfully interjected some funny jokes, and the stop was a brief one. The next stop was a back parking lot where Jay told the rather long story of Count Carl VanCastle who married his dead and embalmed bride. The visual was a building of the funeral home and some laminated photos he pulled out and shined with a lantern. Not a ghost story but a true, gruesome story. The third stop was next to a church and I vaguely remember hearing about ghosts appearing in the courtyard of the church. Supposedly if you took pictures of the courtyard at night, one might see the ghost in the picture but not in reality. So we took pictures on our digital cameras and pressed the review button. Nope, no ghosts on our shots. Imagine that. The fourth stop was in front of a former church? Or school? Can't remember. Something about a fire. Too many passerbys were interrupting by shouting ghoulish comments. Jay warned us of these interruptions and trained us well on how to respond in chorus "GET A LIFE!". It was funny in the beginning but after awhile it became somewhat annoying. I noticed one family that trailed behind suddenly fleed. Lucky them. The fifth stop was in front of a three-story colonial looking house, called the "Artist House". Here the bizarre story of "Robert the Doll" was told in painstaking detail, dreadfully longer than the last one. Walking most of the day (not in heels) my feet were beyond podiatric pain. If I sawed my ankles off that would certainly liven up the tour with real blood and gore! A tempting thought. But for selfish reasons. 1- How fast to talk: Secretaries are hired to type at least 60 words per minute. Speed typing is a plus, but not in tour guides. Jay was speaking 600 words a minute. So fast, sometimes you missed the many jokes and punchlines. Foreigners, were often lost. 2- Know your audience. At the beginning of all my tours (Art Deco walking tours), I always ask where each person is from. This helps me know which "stories" are more relevant to the group. I tailor my tours on the spot. Some prefer more history, others prefer architecture, and other prefer the Hollywood stories. As a tour guide, you don't have to share ALL the facts, because the tour becomes too long and lecturish. No one wants a boring, professor who loves the sound of his voice for a tour guide. On the plus side, his voice inflections were perfect. Eerily quiet in the beginning and building to a frightful crescendo but then he prattled on and different chapters were one long quick story. Note to Ghost Tour Guides: remember to pause between stories. Overall the tour was too long--two hours. Especially when there are only five stops and visuals are minimal. For example, you are directed to visit a museum to see "Robert the Doll", an obsession of a young boy through adulthood. Couldn't they at least stage something so it looks real? Maybe like a haunted house? Am I being too critical? I don't think so. My family of four entirely agreed. Given the promotion on the website expectations were set. The tour failed to meet those expectations. I've taken many walking tours in this country and abroad and this is the first one that I would WARN folks not to waste their money on--$15 a person. 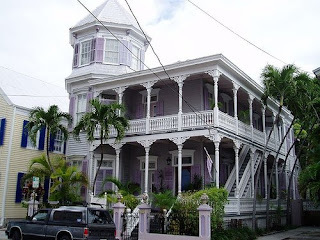 As a matter of fact, I highly recommend the walking tour of the House of Hemingway in Key West. Of course, we had a veteran tour guide and he was excellent! what a hilarious post about your ghost tour, christine! i'm always inspired around halloween to do something like that but have yet to follow through. thanks for stopping by my Site. after all the hoopla surrounding my "hit or miss" post it was nice to see a friendly comment again! Well, I do not what to say,I like your story. I know I love to see, hear and read misterious Stories about different places of this country, I love scarries movies and every thing related with Ghosts,"Oh boy, I would like to have that Tour". I live in New Jersey, Monmouth County,and one day may kids were talking about some kind of incident that happened on halloween day more than 100 years ago in a city next to us, and for 1 week they were goint over and over that place arround 11 pm and 1am to see if they can find any sign but... no luck.